Well too bad for you guys I guess, because I'm going to give you my two cents anyway. For the second week in a row, I'll be reviewing a wonderful canned beer. 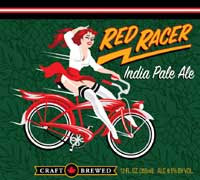 Red Racer IPA produced by Central City Brewery out of Vancouver. They seem to have a decent variety of beers, so I'm assuming I'll give each of them a whirl in due time. But as for the Red Racer, I say if you see it, buy it. Apparently it won the best beer in British Columbia in 2008-09, but isn't that kind of like being named the toughest guy in France? I mean who's their competition, Molson? Overall though, it comes across very IPA'y, meaning that the hops jump out at you immediately, however, I seemed to be left with a malty aftertaste. If you're an IPA fan, you'll definitely want to check this out. And at a decent 6.5%abv, it's got a decent kick to it too. I'm going to give it a sold 3. I want to go higher, but my gut is telling me to stay with the three. BC has just under 50 breweries and brewpubs.